Our Race Car playmat is ready to roll! This adorable playmat gives a raceway for your kiddos’ cars, and when you’re finished playing you can just roll it up for storage! The race car playmat is a beginner-level pattern that is really easy to make and customize! 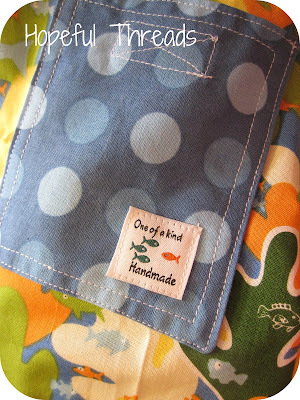 For this fabric you can use up scraps! One yard will do it for the top and back, plus black fabric for the track and scraps for the shrubs, lake, tunnel, house, and letters. If you make this or any of the other patterns out of the book, be sure to pop on over to Flickr and let us see! We’ve all been there – you get your little man all dressed up for a special day (or even an average one! ), only to discover that his pants won’t stay on. Our Hold ‘Em Up Belt is here to solve that problem! It’s so easy to make, and easy on your little guy to put on and take off. Win-Win! This is a beginner-level pattern for a simple fabric belt with loop closures. You’ll need a piece of fabric that is 3″ wide by your child’s waist measurement plus 6 extra inches to make this belt. Time to stash-dive! You’ll also need coordinating thread and a set of 1 1/4″ D-rings along with some heavyweight interfacing. Fabric recommendations: quilting cotton, linen-cotton blends, corduroy, cotton canvas, home decor fabrics. Do you want a quick and easy DIY belt? Whip one up and share it with us in the pool – we might feature yours next! If you have a kid in your house who likes to build with tiny little plastic bricks, chances are you’re also stepping on those bricks on a regular basis, and possibly also rescuing mini-figures from the mouth of your dog – or your toddler. Put those bricks where they belong and have them ready to go anywhere with your little builder with our Brick Bag Carry-All! The Brick Bag Carry-All is designed to hold small plastic toy bricks with gathered interior pockets for easy grabbing and building. The case also has mini elastic loops to hold tiny little men, aliens, historical figures and animal figures. This is an advanced-level sewing pattern. To make the bag, you’ll need 1 1/4 yards of fabric for the exterior, 1 yard for the lining, 1/2 yard of interfacing and 1 1/4 yards of webbing for the handles. You’ll also need thread, a sewing needle, two 20″ zippers, a package of bias or twill tape, 1/4″ wide elastic, basting tape or zipper tape and cardboard. Fabric recommendations: canvas, denim, twill, home-decor weights for the outer shell and quilter’s cotton or flannel for the interlining and pockets. Do you have a brick-builder in your house? Make up a bag and share it in our Flickr pool – we might just feature your project next! Today we’re talking art supplies! If your kids are at all interested in coloring, chances are they leave stray crayons and scraps of paper all over the house, right? The To-Go Artist portfolio is here to rescue you – and those art supplies! The To-Go Artist is a portfolio designed to hold crayons, markers, colored pencils and a pad of paper. It keeps your child’s art supplies organized and ready to go anywhere: a trip to the doctor’s office across town or to Grandma’s house across the country! You can use your fabric remnants and scraps to make this portfolio in any combination of colors! Recommended fabrics: canvas, canvas blends or home decor weights for the outer fabrics and quilter’s cotton for the pockets. To make this pattern you’ll also need thread, medium-weight interfacing (if you use quilter’s cotton for the whole thing), Velcro, a universal needle and water-soluble basting tape. What will you make for YOUR little artist on the go? Come and share your creations in our Sewing for Boys – The Book – Flickr pool! Your little guy will feel like a real man when he gets to wear a robe just like his dad; that’s where the Just Like Dad Flannel Robe pattern comes in! This pattern is designed for two fabrics so the robe will have a comfortable weight and softness and also contrasting lapels and cuffs. This is a beginner-friendly pattern; it has pieces for the fronts, back, sleeves and belt. The Just Like Dad robe comes in sizes 2/3 to 6/7. You’ll also need a universal needle and thread to sew this robe. Thanks so much to the fabulous sewists who have contributed to the Sewing for Boys Flickr Pool! Will your project be featured next? Jump right in! Today’s pattern spotlight is the Out on the Town Jacket! This dapper little jacket features a vintage feel with modern comfort for your little gentleman. Make a formal jacket for dining out or a special event, or choose a more casual fabric to make a laid-back afternoon jacket for any day of the year! This is an intermediate level sewing pattern, featuring pieces for the back, fronts, pocket and sleeves. The Out on the Town Jacket is sized for 18 months through size 6/7. This pattern also requires thread, 3-5 buttons, lightweight fusible interfacing, a fabric marking pen or chalk and water-soluble basting tape. Have you made one of these jackets for your little man to wear out on your town? 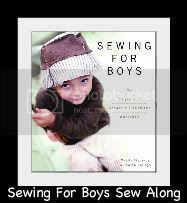 Share it with us in the Sewing for Boys Flickr pool; we’d love to see it! Those of you in the Southern Hemisphere are probably soaking up the sun right now, while those of us in the northern half of the world are dreaming of those summer days yet to come! Here’s a little sunshine for your day – a pattern spotlight on “Bobby’s Bathers,” a pattern from Sewing for Boys that’s perfect for swimming trunks or everyday run-around shorts. Bobby’s Bathers is a pair of swim trunks that actually have a customized fit for your little guy. No more one-size-fits all trunks for him! Recommended fabrics: waterproof nylon, poly-cotton blend for swim trunks. Make them into regular shorts by using cotton, seersucker, ticking, linen, or cotton shirting. You’ll also need thread, Velcro, 1″ wide elastic, lightweight iron-on interfacing, and 1/4″ cording to make these shorts. A few lovely bloggers have made these shorts and shared them with the world, and we’re delighted to feature them today! Kristy from Hopeful Threads made a pair that’s just swimmingly cute (sorry, we couldn’t resist that one)! Nicole from LilyBug Designs also made a pair – we’re overwhelmed by the seersucker cuteness! We love how this simple pattern (it only has two pattern pieces to maneuver!) can become an instant outfit for any occasion. 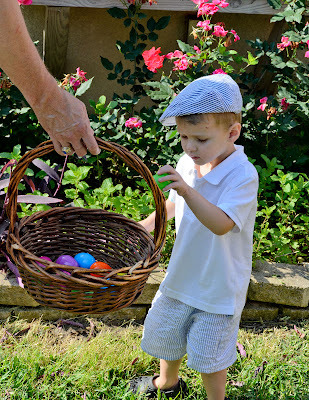 The seersucker is just perfect for Easter, especially with the coordinating cap! Thanks so much to Kristy and Nicole for sharing their projects with us! Would you like to be next? 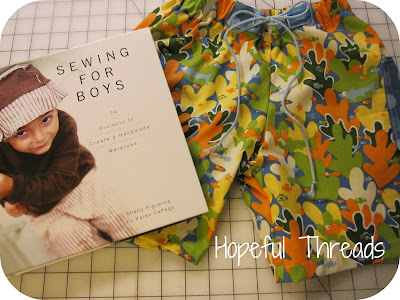 Share your photos in the Sewing for Boys Flickr pool whenever you make something from the book, and we just might highlight your projects in our next post! Today we’re happy to feature the many wonderful variations our Flickr Pool members have made for the Mimi’s Boy Suspender Shorts pattern! High-waist detail adds a vintage touch to this timeless pattern. The adjustable buttons mean he’ll be able to wear them for at least two seasons. To make these shorts you’ll also need coordinating thread, a universal needle, 3/4″ wide buttonhole elastic, 6 buttons, and fusible interfacing. 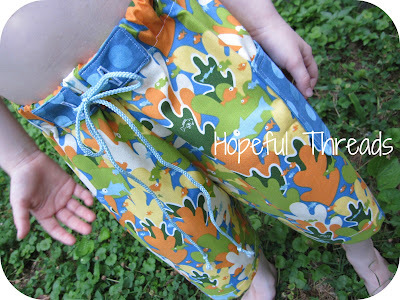 Let’s look at the adorable suspender shorts from our pool! These adorable baby blues just melt your heart, don’t they? Or maybe it’s the model! This little guy is ready for adventure, in pants that won’t let him down (or fall down on him)! We love how this pair is cozy and comfy! Have you made the Mimi’s Boy Suspender Shorts, or any of the other patterns from Sewing for Boys? If you have, come and share them in our Flickr pool! We might just feature your sewing project next! Time for another pattern spotlight! This time we’re featuring the Short-Sleeve Raglan tee, a true wardrobe staple. Once you make one, you’ll be looking for excuses to fill your little one’s closet with more! I can speak for this shirt personally as my son owns it – it is the softest, most comfortable tee your kiddo will ever wear! The seams on this shirt are on the outside, and they’re designed that way intentionally so that all of the seams on the inside are enclosed and super-soft. Even the most sensitive kiddo will live and play comfortably in a shirt like this! This is a beginner-level pattern. You do NOT need a serger in order to make this top! You will, however, need thread, a universal stretch needle, and double-sided water-soluble basting tape (or at least, that last one is super helpful). What about you – will you make YOUR kiddo’s new favorite t-shirt next? If you do, share it with us in the Sewing for Boys Flickr pool and we might just feature your project in a future post! Have you seen the adorable versions of the Sewing for Boys patterns that are popping up all around the Interwebs? We have, and we’re smitten! We wanted to take a moment to spotlight some of these patterns so you won’t miss out on all the cuteness! “R is for Romper” is a pattern written for babies and toddlers; this raw-edged romper is an intermediate level pattern and it includes smooth seams for baby’s sensitive skin. The book includes a snapped bottom so you can change diapers with ease, which is a big benefit for the moms out there who will dress their kiddos in this adorable outfit! Recommended fabrics: medium-weight knits with at least 30% stretch such as cotton jersey, bamboo rayon, rib cotton knit or French terry. To sew this pattern you will also need a ball point needle, lightweight fusible or knit interfacing, and 8 sets of poly-resin snaps. Let’s take a look at the gorgeous R is for Rompers out in the wild! And don’t forget, this pattern is very gender neutral, despite the name of the book. Just look: Owls! On a girl! We hope you’ve enjoyed this little round-up; stay tuned for more sightings of the Sewing for Boys patterns out in the wild! Have YOU made a pattern from the book? 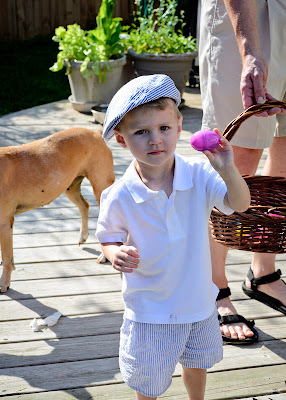 Share it in the Sewing for Boys Flickr pool and we might just feature your project next!